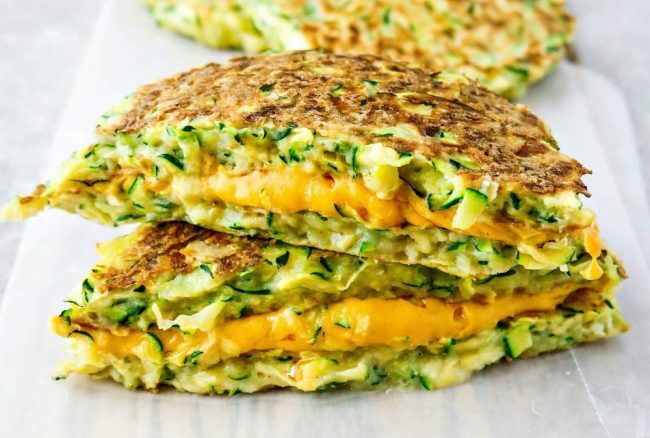 To boost the intake of nutrient-dense vegetables and optimize the levels of vitamins in your body, you can replace your sandwiches with dairy and grains with the following delicious and healthy Grilled Zucchini Sandwich oozing with cauliflower cheese. Zucchini is incredibly versatile, surprisingly healthy, and packed with nutrients. Therefore, its consumption improves health in numerous different ways. “Zucchini contains zero fat and is high in water and fiber. It also contains significant amounts of vitamins B6, riboflavin, folate, C, and K, and minerals, like potassium and manganese. The sandwich bread consists of grated zucchini, which has a rich texture and flavor, and lots of potassium and fiber. Instead of all-purpose flour, use cassava flour, with some nutritional yeast, rich in amino acids. On top, you should add cauliflower cheese, which will start melting and boost the amazing taste of the sandwich. In a medium mixing bowl, add the grated zucchini, cassava flour, nutritional yeast, eggs, and sea salt. Heat the avocado oil in a skillet over medium heat. Scoop half a cup of the mixture onto the hot skillet and shape it into a rectangle using a spatula. Cook it for 3 minutes on each side. Next, divide the cauliflower cheese onto two zucchini bread slices, place onto a pan, and heat the sandwich until the cheese starts to melt.